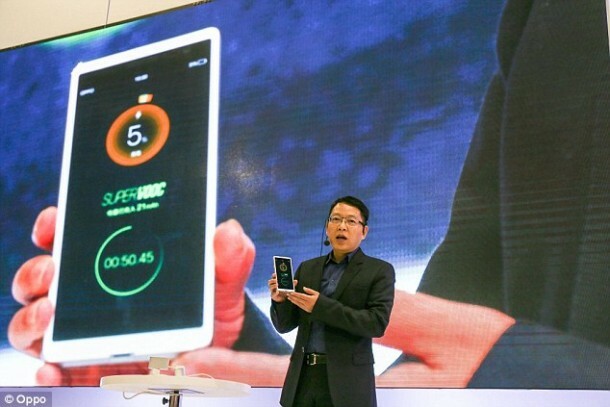 Oppo has claimed that its new technology is capable of charging a smartphone within 15 minutes flat. The Chinese firm unveiled the prototype named the Super VOOC Flash Charge at the Mobile World Congress in Barcelona this week. It is being touted as the world’s fastest charger and is an improvement on Oppo’s VOOC Flash Charge technology. It has been designed to be used with the Oppo’s battery (2,500mAh battery). It can be charged by with either MicroUSB or US Type-C. The prototype is a big step towards advancing the current technology. The iPhone 6s, for example, takes about 2 hours for charging completely with an Apple’s standard charger. Oppo stated that its technology relies on proprietary technology where the hardware, battery and control software work in harmony for optimizing performance. Oppo further revealed that the new system will be incorporated into the upcoming phone and that’s about all the details that have been released so far. As of now, the company has a total of 18 patents pending for this particular technology. It sold about 10.8 million smartphones and was able to, thus, secure a 9% market share and a top-5 ranking in the 4th quarter of last year. The system, named as ASAP Dash is capable of storing 5,000mAh. According to Joe Levi, senior editor at Pocketnow, “’The language used warrants a little explaining. You can charge the portable battery with enough energy to charge your iPhone 5 in only five minutes – or three charges in 15 minutes. That’s impressive – but it’s still not going to charge your iPhone any faster than plugging it into the wall.” It only means that you’ll be able to charge this device in 15 minutes and then use it to charge your smartphone at the regular charging pace. However, this might not be the case with the smartphone that will feature this technology, as promised by Oppo.